Some politicians argue that taking action to protect the environment will harm the economy and cost jobs. However, a recent national survey finds that only 15% of Americans agree with this claim. Instead, a large majority of Americans (60%) say that in the long run, protecting the environment actually improves economic growth and provides new jobs, while another 22% say that protecting the environment has no impact on economic growth or jobs. Only 15% of Americans think environmental protection harms the economy. In other words, 82% of Americans say that environmental protection is either good or neutral for economic growth, while only 15% think environmental protection harms the economy. 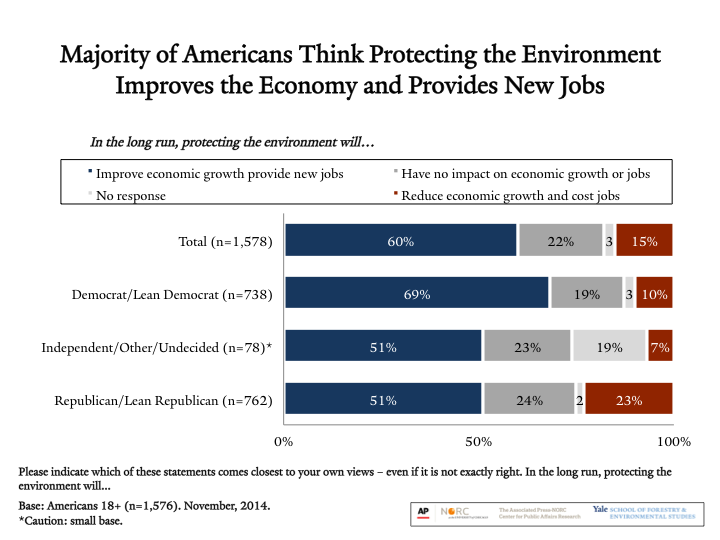 Of Democrats, 69% say protecting the environment improves economic growth and jobs, 19% say it has no impact, and only 10% think the economic impact is negative. Of Republicans, 51% say that environmental protection has a positive economic impact, 24% say it has no impact, while only 23% think the economic impact is negative. Even a majority of conservative Republicans say environmental protection has either a positive economic impact (45%) or no impact (25%), while a minority (29%) thinks it has a negative impact. Among moderate and liberal Republicans, 62% think environmental protection has a positive economic impact, 24% think it has no impact, and 11% think the impact is negative. Likewise, majorities of women (64%), men (56%), African-Americans (71%), Hispanics (59%), non-Hispanic whites (59%), born-again/Evangelical Christians (53%), non-Evangelical Protestants (62%), and Catholics (62%) all say protecting the environment improves the economy, while much smaller minorities think it harms economic growth. Perhaps most striking, however, is that a number of key socioeconomic factors do not correspond to people’s views. 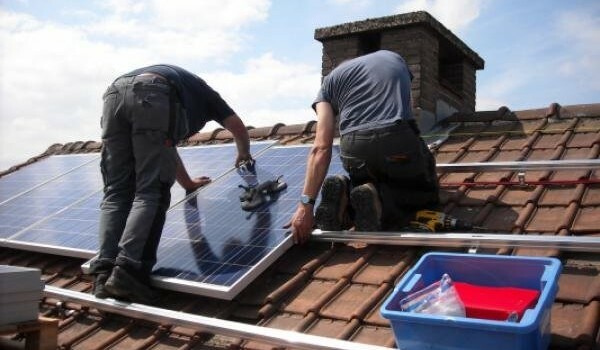 For instance, both people who are currently employed (60%) and those who are not employed (59%) say that protecting the environment improves economic growth and provides new jobs, with only a small percentage of each (16% and 15% respectively) who think it reduces growth and costs jobs. Moreover, there are also no differences of opinion based on measures of household income or education level – majorities of rich and poor, and those with or without a college degree all say protecting the environment improves economic growth. This report is based on findings from a nationally representative survey – The Yale AP-NORC Environment Study – conducted by researchers at the Yale School of Forestry & Environmental Studies (http://environment.yale.edu/) in partnership with the Associated Press-NORC Center on Public Policy Research (www.apnorc.org). Interview dates: November 20 – December 1, 2014. Interviews: 1,578 adults (18+) in all 50 states. Average margin of error: +/- 3 percentage points at the 95% confidence level. The research was funded by the Yale School of Forestry & Environmental Studies. For tabulation purposes, percentage points are rounded off to the nearest whole number. As a result, percentages in a given chart may total slightly higher or lower than 100%.